History/Mythology: Que Sera was first reseached and named Que Sera by Melody. It comes from Brazil and it a mixture of Quartz, Kaolinite, Iron Oxide, Calcite, Magnetite, Clinozoisite and Leucozene and each stone no matter what the colour is is reputed to have the same vibration and properties of all the stones listed. Que Sera was named after the properties of the stone which are very much in alignment with the song ‘Que Sera, Sera’ or ‘Whatever will be will be’. Melody named them Que Sera crystals, firstly the Q for quartz and the UE for Undulatory Extinction and then for the old Doris Day song, Que Sera Sera, whatever will be will be, and this relates to its energy the stones hold. Que Serz or Blue Liberite is a very interesting stone due to the unusual mix of crystals that are all combined into the one stone. Due the combination of different stones this crystal works through all of the chakras. It is a very calming stone that helps to bring about peace and serenity. When you hold it you will feel a very comforting vibration. 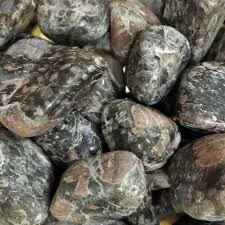 This stone has a wonderful protective field particularity in the area of electromagnetic output. Que Sera helps to stimulate your phsyci ability and helps you to connect with higher vibrational beings. Healing – All round healer, clears blockage, helps with cellular degeneration and adrenal fatigue symptoms. Can be used in all meditations to find peace and calm. Wonderful as a healing tool as it can be used on all of the Chakras. Use in Grids in order to protect against electromagnetic energy.